Roasting strawberries brings out so much of their natural flavors and sugars, it’s a crime to NOT roast them! Plus, it’s a great way to use those strawberries that have been in the fridge a week too long. 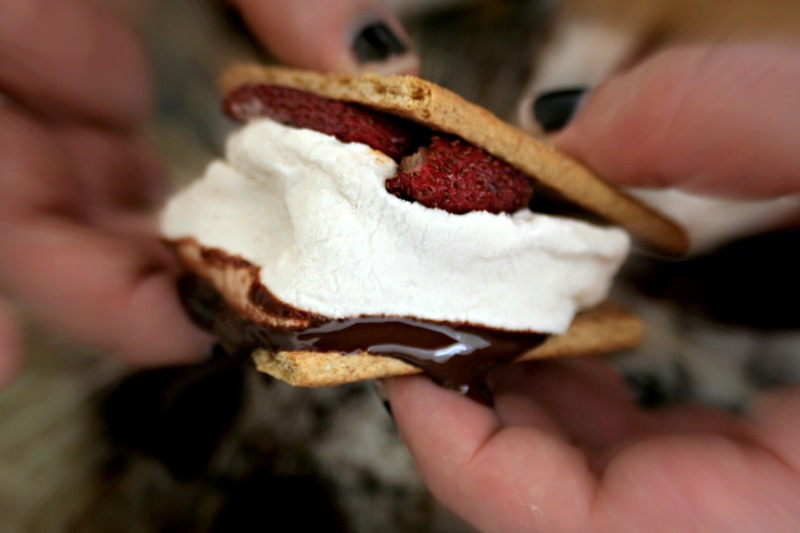 Roasted Strawberry S’mores are a great way to bring back the fun summer activities, indoors! Summer in New England can be summed up in one word: campfires. New Englanders, specifically Cape Codders, love a good campfire. Normally it’s because they’re on the beach and want to be around a heat source while snuggling into their Vineyard Vines sweaters while roasting s’mores. But just because summer is over doesn’t mean that s’mores have to go with it. Using your oven at home to roast them makes it quick and easy on any given day – summer or winter! And can I be honest? I cannot wait for the first snow fall! I’m already looking forward to relaxing with M. at home, cooking endless meals together, reading on the couch while he watches ESPN, sipping on hot chocolate. Those are the simple things that make me happy, since during the summer the only time we spend together is at work. Simple recipes are sometimes the best, right? And that’s what we’ve got today. But first, let’s talk about roasting strawberries. Sliced in half, these berries had no chance against the hot oven. The heat literally tackled the berries into a smaller version of themselves, the liquid inside of them evaporating, the sugars turning into caramelized heaven.So simple, yet so amazing. And sure, you can make your own marshmallows. I’ve made some awesome Key Lime Marshmallows as well as Almond Marshmallows and while probably be making a new batch for all the hot chocolates I will have this summer. But since time is of essence when I’m craving s’mores, I grabbed a bag of these Strawberry Balsamic Marshmallows I received as a gift from Mallow – Artisan Marshmallows, while I was in Seattle. The perfect flavor pairing to my roasted strawberries, the balsamic was a tart undertone that balanced the sweetness of the treat! 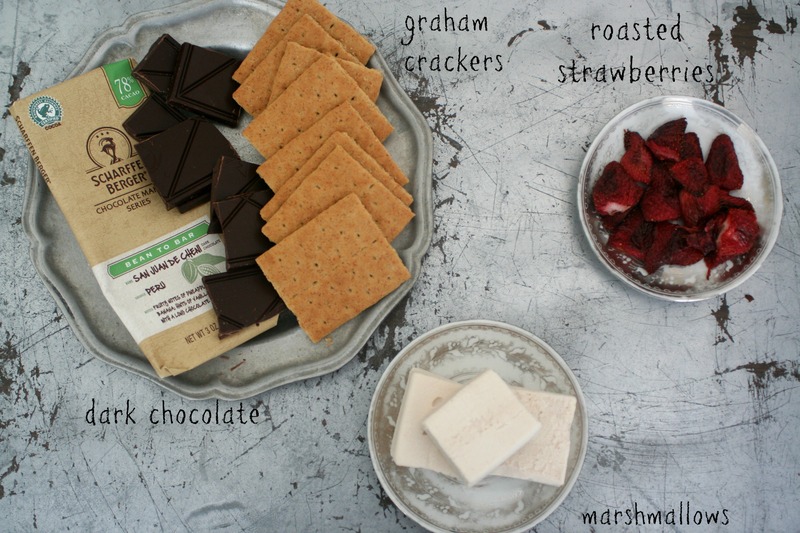 Grab some graham crackers, break off a few piece off of your favorite chocolate bar (current favorite: SAN JUAN DE CHENI – 78% CACAO DARK CHOCOLATE – LIMITED EDITION), and get to roasting some strawberries! These s’mores might just become our favorite cool weather treat! Simplicity at its finest, these s'mores will become a family favorite - quickly! Preheat oven to 400F. Place sliced berries on lightly greased baking sheet. Bake for 20-30 minutes, until berries are fully roasted and darker in color (dark wine red). Cool berries. In the meantime, place on a baking tray the graham crackers, a piece of chocolate, and the marshmallow. Turn your oven to broil and broil for 1-2 minutes. Remove from oven, top with roasted strawberries and cap with another graham cracker. Enjoy! « Jam Mocktails: Delicious Fruity Fun! These sound and look so amazing Nelly! !